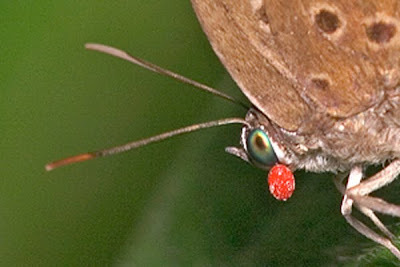 Occasionally, when out in the field photographing butterflies, members of ButterflyCircle encounter strange red globular attachments to adult butterflies - usually at the head or eye of the butterfly. Curious as to what these little critters are, I searched the internet and found that butterflies do fall victim to certain parasitic mites. 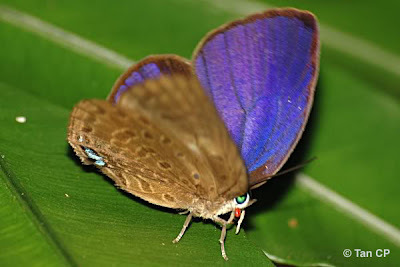 Interestingly, the majority of these encounters affect the smaller butterflies in the Lycaeninae family, even though there are examples from the Riodinidae and Hesperiidae families. So far, we have not encountered these mites on the larger species of butterflies yet. Although theoretically, there should be no reason why these mites could not attach themselves to larger butterflies as well. But by far, there have been more observations of these mites on Arhopala spp than any other butterfly genus. 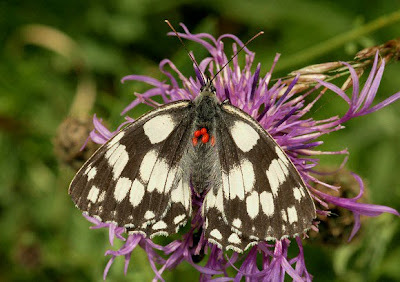 In his excellent and informative website Learn about Butterflies, ButterflyCircle member Adrian Hoskins wrote about these mites on the British butterfly the Marbled White (Melanargia galathea), and in the example shown, a number of these mites were attached to the thorax of the butterfly rather than the eye or head, as is the more common occurrence in Singapore. Adrian noted that these mites were of the species Trombidium breei and that "studies have shown that these mites are harmless to the butterfly, having no detectable effect on the flight performance, orientation ability or lifespan". A parasitic mite on a Hesperiidae. 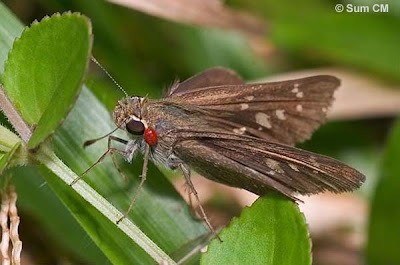 Even fast-flying skippers cannot shake off its little red passenger. It is interesting to learn that despite being parasitic in nature, these mites have little effect on the lifespan of the butterfly. 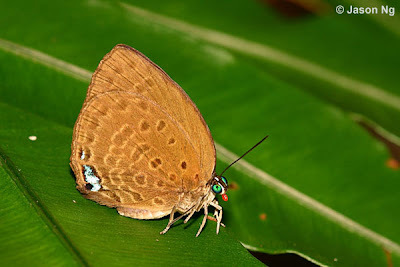 However, it is not known if the mites found on butterflies here in Singapore are of the same species of mites. 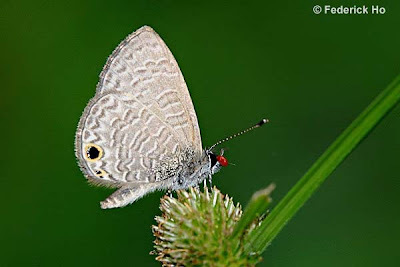 Perhaps if a reader of this blog who is an authority on mites may want to contribute his or her knowledge about what these little stowaways are and if they cause any harm to the host butterfly. 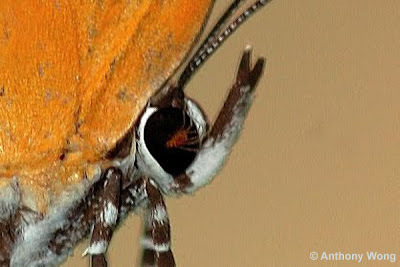 Indeed, where a butterfly is encountered with one of these mites attached to its eye or head, the flight of the butterfly did not seem abnormal, nor did the butterfly display any discomfort or make any attempt to remove the mite with its legs. These butterflies observed seemed to be able to carry out their normal activity like feeding and flying around without much hindrance. In two of the cases shown here, the mites are rather 'skinny' where the legs can be seen. It is not known if the mites actually grow fatter as it feeds off the butterfly or if these are of a different species of mites. Parasitic mite on the eye of Abisara geza niya. Inset : Close up of the mite. Is this a different species from the fatter mites? 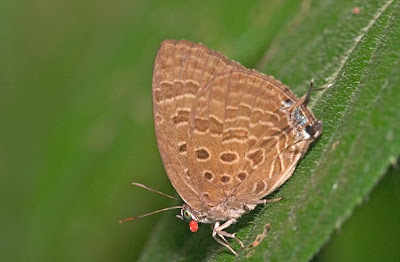 It is likely that these mites lurk on flowers and vegetation where these butterflies frequent, and are able to quickly attach themselves to the butterflies when they stop to rest or feed at flowers. 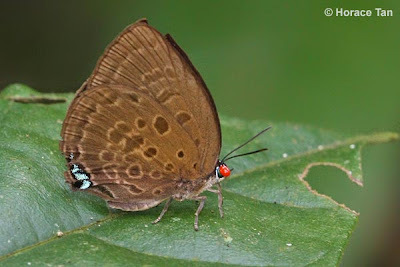 However, why they appear to generally attach themselves to the head/eye region of the butterflies observed in Singapore remains a mystery. 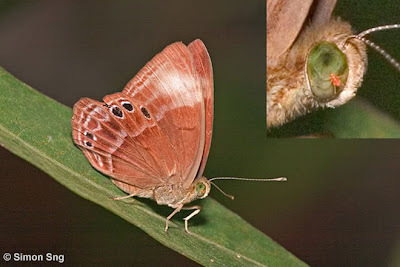 The fact that most of the encounters over the years by ButterflyCircle members show this phenomenon of a single mite attached to a butterfly's head or eye appears to reflect the consistency in which this happens in the field here in Singapore. Similar-looking mites also parasitise other invertebrates like the Harvestman as is shown at this link. So when you're out there in the field, observing and photographing butterflies, keep a look out for these little red dots on the butterflies, and record your observations and findings. If you have any clue as to what these species of mites are or how they affect the butterflies that they parasatise upon, do share your views with us. Text by Khew SK : Photos by Adrian Hoskins, Anthony Wong, Federick Ho, Jason Ng, Horace Tan, Simon Sng, Sum CM & Tan CP.